This Wonder of Canada almost speaks for itself. From the brilliant blue of Lake Louise, the Valley of the Ten Peaks, towering Mount Robson, Moraine Lake, not to mention the gorgeous Banff Springs Hotel… all these magnificent jewels set brilliantly in one, whopping “wonder.” The Canadian Rockies are distinct from the American Rockies as they have been been very heavily glaciated, resulting in sharply pointed mountains separated by wide, U-shaped valleys gouged by glaciers, whereas the American Rockies are more rounded. That’s why, even though the Rocky Mountain Range runs from Northern British Columbia to New Mexico, we can claim our very own “Rockies” as a distinct wonder of Canada. I lived in the East for years but never was I in more awe then when I first encountered the Canadian Rockies. They take you into a Canada that makes you feel how great and big this country really is. 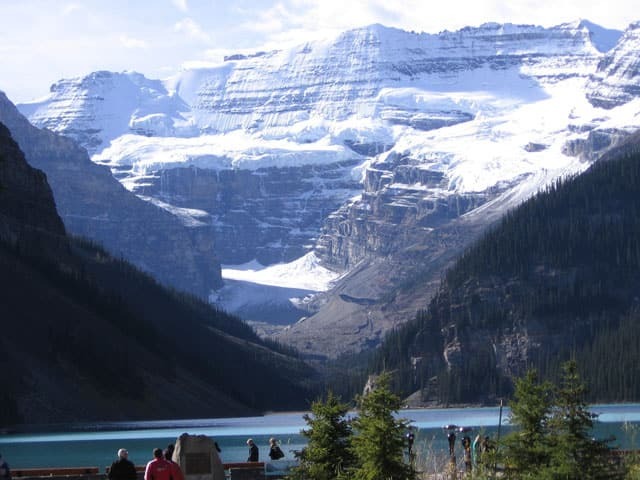 The magestic snowy rocky mountains, glaciers, turquoise water lakes, rivers and streams and one the earliest canadian world heritage sites are simply inspirational and the greatest symbols of the glorious Canada vast landscape. Morraine Lake in the Valley of the Ten Peaks culminates the beauty of water and mountains in one gorgeous place. I do not have words to describe it. I thought my heart was going to leap out of my chest. The valley was laid out beneath us – and in every direction there were more and higher peaks, yet I felt I was truly at the top of the world. We sang, we laughed and cried and stayed as long as we could, just ‘being’ - wanting to prolong this, what was for me a deep spiritual experience, as long as possible. I wish to nominate Morraine Lake in Banff National Park. The sight is magnificent. I have sat on a bench overlooking Morraine Lake and the mountains in the Valley of the Ten Peaks and have felt perfect peace. This is an absolute must see when visiting Banff National Park. My wife, 8 month old Son and I drove to Alberta from Ontario in October of 2006. We witnessed many breathtaking views along the Glacier Parkway, hwy 93. None could compare however with the beauty of Lake Louise, it was spectacular. 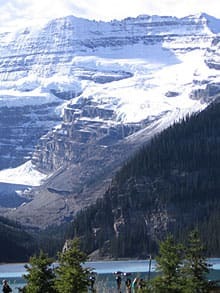 I respectfully submit my selection for the most beautiful place in Canada as Lake Louise, Alberta. The Rockies have many charming huts and cabins, for those who fancy a wilderness experience involving a roof over their head. Most of the huts are owned and operated by the Alpine Club of Canada (ACC). Though many were originally designed with summer mountaineering in mind, several are also used for ski touring. Many are outfitted with wood stoves, lanterns, cook-stoves, cooking utensils and sleeping pads. Ivy Li: Standing in the gorgeous Alpine Meadow, Elizabeth Parker Hut honours the co-founder of the Alpine Club of Canada. This patriotic female journalist of Winnipeg Free Press and her daughter were the first women members of ACC, making ACC the first alpine club in the world to accept female membership from its inception. Sitting at 9600ft, between Lefroy and Victoria, Abbot Hut, named after the first climbing fatality in the Rockies, was the first high altitude climbers hut in Canada. Until 1983, it was the highest permanent building in the country. The stone hut was designed and built by the Swiss mountain guides in 1923, aiming at making climbing safer. Except the rock which was quarried on site, two tons of materials were carried up by the guides on their backs through the avalanche prone Death Trap and up very steep terrain. The hut and the guides, and the fact that no one died during the construction, were wonders in Canadian history. According to one website, the Banff Springs Hotel is reputed to have its very own ghost… that of a young bride who tripped on her wedding dress while descending the staircase and fell to her death on the marble tiles below!